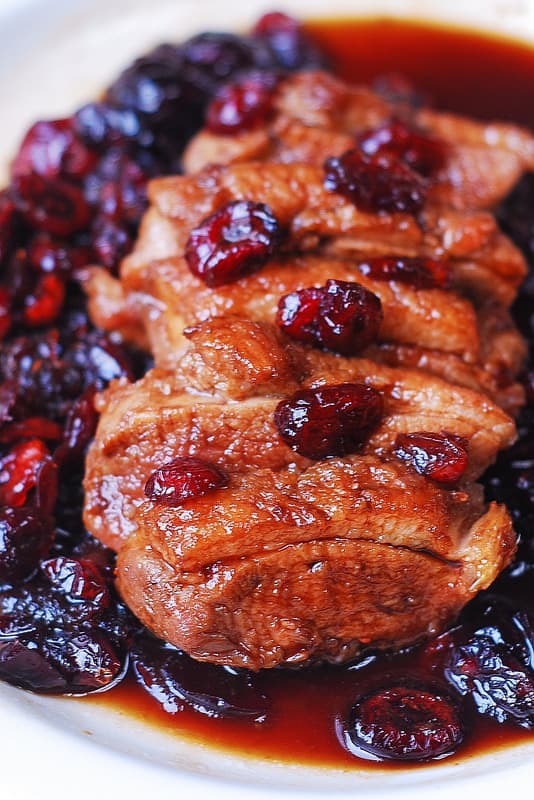 Duck Breast with Cranberry Sauce – one of the best recipes you can make for a special occasion or a holiday! Duck is my go-to meat for any special occasion. It’s easy to cook and looks amazing on a holiday table. 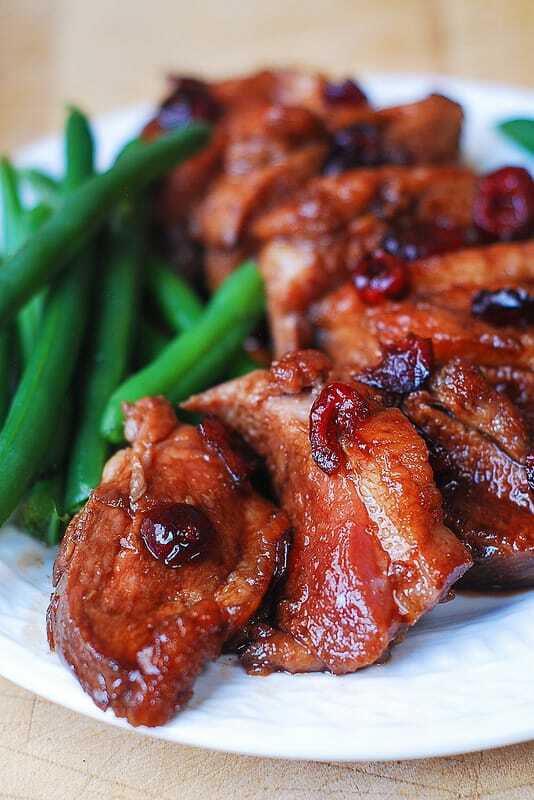 While I love to cook the whole duck, cooking duck breast is much easier and quicker time-wise. This recipe will make a perfect main dish for any special night, anniversary celebration, or holidays, especially Christmas or New Year’s Eve. 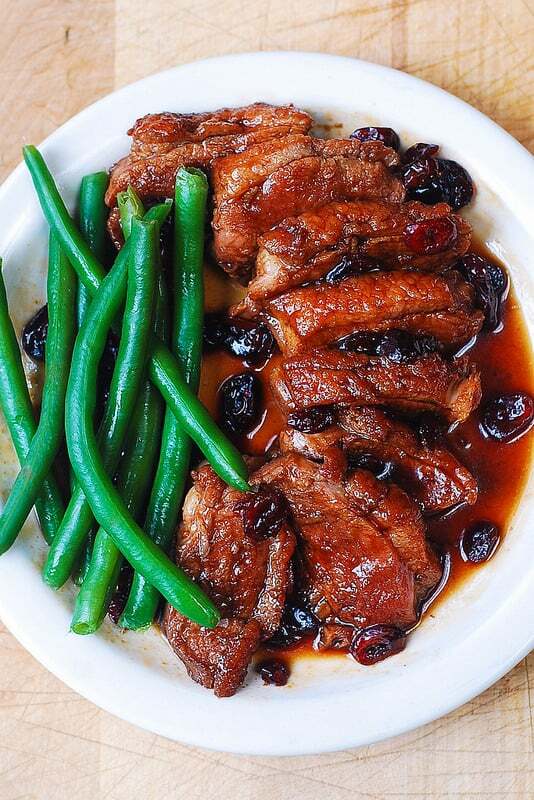 While duck meat on its own has a lot of rich flavor, it always tastes better when paired with a nice fruity sauce. 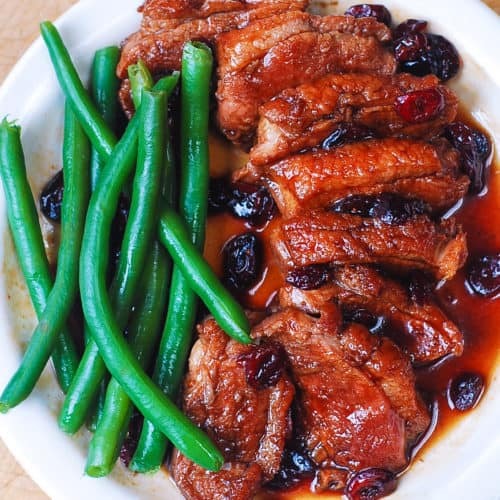 There are lots of fruit-based and berry-based sauces sold in many grocery stores specifically intended to be served with all kinds of meat (including duck), but my favorite sauce for duck breast is undeniably this simple homemade cranberry sauce that has only 3 ingredients: honey, balsamic vinegar, and dried cranberries. When you combine these 3 ingredients together and heat them up, something magical happens. 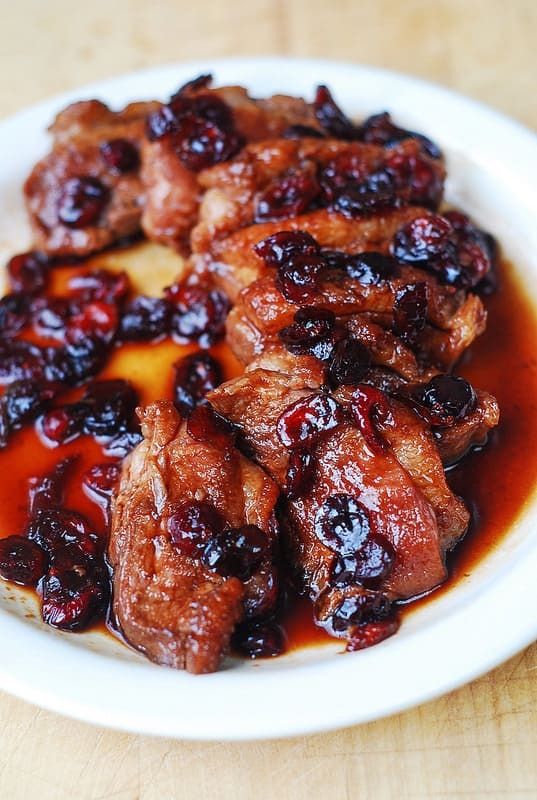 The sauce thickens up, it becomes both sweet (honey) yet somewhat tart (balsamic vinegar), the dried cranberries puff up and become thick and juicy, yet retaining their sweetness and a touch of tartness. The sauce is so good, I had a hard time not eating half of it as I was cooking it. You might have to double your cranberry sauce ingredients – it’s that good! I served this duck breast with cooked green beans and scalloped potatoes. YUM! If you want more ideas for side dishes, you can try Garlic and Bacon Green Beans, or Roasted Brussels Sprouts, Cinnamon Butternut Squash, Pecans, and Cranberries. I also have a recipe-tutorial with lots of photos describing pretty much this whole process of cooking duck breast in photos, but without the cranberry sauce: how to cook duck breast. You might want to check this tutorial as it will help you visually see all the steps. 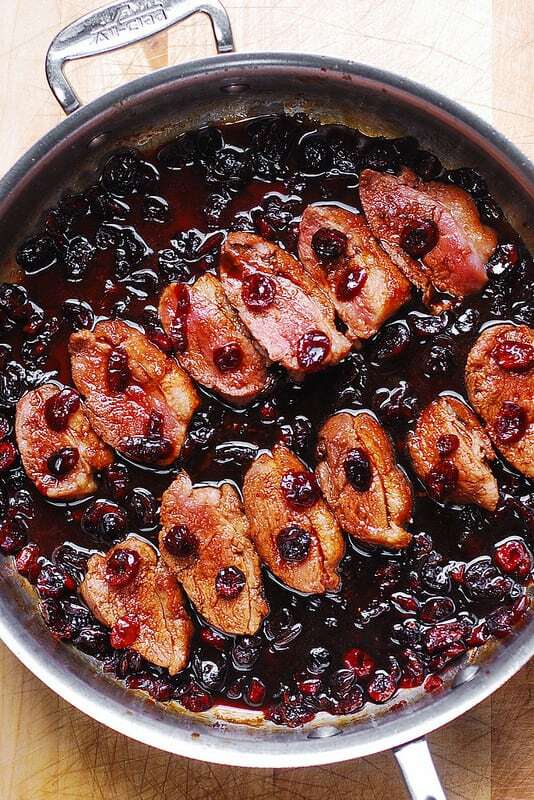 Duck Breast with Cranberry sauce will make a perfect main dish for any special night, anniversary celebration, or holidays, especially Christmas or New Year's Eve. Use a large cast iron pan, or use a large stainless steel skillet. Cook the duck breasts, uncovered, for about 8 minutes on medium heat on the skin side, until the fat is released. After 8 minutes of cooking, remove all of the duck fat from the skillet (leaving just a very small amount of fat, enough to lightly coat the bottom of the skillet). Turn the duck breasts over to the other side (non-skin side) and cook for 2 more minutes on medium heat. Remove the duck breasts from the skillet to a plate. Use the same skillet (the duck breasts should've been removed to the plate, and the skillet itself should not have any visible duck fat, just a tiny amount of fat + some bits from cooking the duck - remember you removed most of the duck fat in one of the steps above). To the same skillet, add honey, balsamic vinegar, and dried cranberries. Bring this mixture to boil, constantly stirring, then reduce heat to low and simmer for 1 minute, stirring, until the sauce reduces just a bit, and the cranberries puff up. Slice duck breasts thinly, they will be raw in the middle. Add sliced duck to the skillet with the sauce, on medium heat, and continue cooking the duck breast slices in the sauce for 1 or 2 more minutes, turning the slices to make sure to cook on each side until the duck is medium rare. 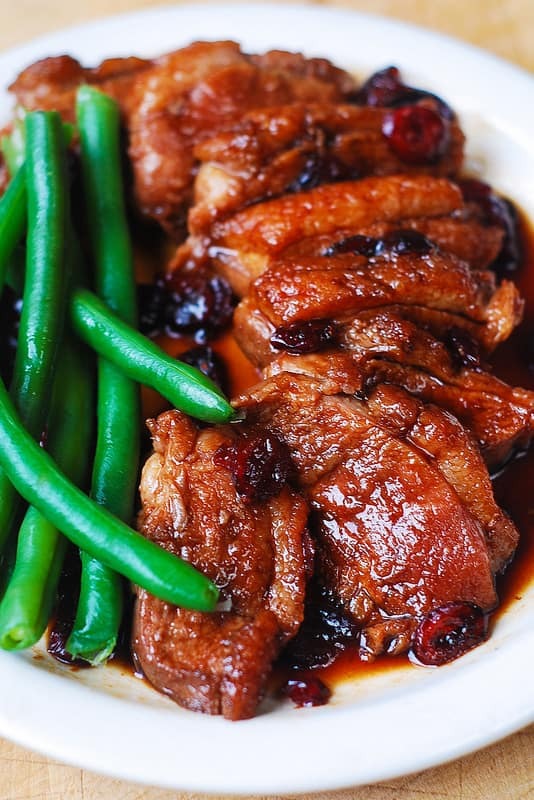 While you cook the duck in this way in the sauce, it will help thicken up the sauce, as well as warm up the duck to the right temperature. Superb its a must for any duck lovers!! Brilliant! !